The research team interacted with several organizations (GO, NGO and private sector) implementing programmes for rural women and with some of the women self-help groups/farmer interest groups. The stocktaking was also intended to find out whether any new approaches in design or implementation of rural women programmes was adopted during the last five years (after the development of the “Cafeteria for Women in Agriculture” by the same team). In 2007, when the project team did this stocktaking, we realised that nothing much has changed in the way the programmes are designed or implemented. The major change at the district level is the formation of the Agricultural Technology Management Agency (ATMA). This has ensured some additional funding. The funding through ATMA can only be termed as supplementary (Rs. 20-25 lakhs/year) as it can only support some additional activities, which the line departments are already working on. The funding is also meagre, considering the limited number of activities this amount can support. However, in recent years, the ATMA finances have improved. Most of the programmes for women in agriculture, implemented by departments such as agriculture, animal husbandry, fisheries or sericulture, are subsidy and input focussed. Programmes implemented by other rural development organisations also have a higher allocation for distribution of inputs and provision of financial support. Over the last one decade, the SHG movement, mainly the thrift and credit groups of rural women, have spread across these two pilot states (AP and TN). This improved the access of rural women to loans and revolving funds. Technical training and exposure visits to members and groups interested to take up farming or any other enterprises definitely helped women in taking up new enterprises. However, the limited access to markets and lack of skills on understanding and responding to markets has constrained several potentially viable enterprises from expanding. 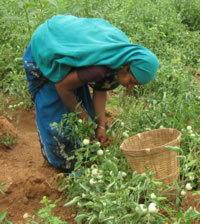 Rural women clearly need access to markets. Their capacity to respond to market changes also needs strengthening. Rural women clearly need a range of support -- organisational, technical, marketing and enterprise development. However, this is often not available. The Department of Agriculture does not have the needed skills to provide this integrated support. Therefore, they have to collaborate with others who have this expertise. Sending women groups for a training programme is not enough. What most of the groups need is “hand-holding” (mentoring) over a period until the enterprise matures, which many of the bureaucratic organisations have difficulty to organise. Integrated support to women can be ensured, only if these different agencies with varied and complementary skills interact and share their expertise. However, the Department of Rural Development and the agricultural departments (including agriculture, animal husbandry, sericulture, fisheries, KVKs and ATMA) do not work together and the interactions among them are weak. Public sector-NGO interactions are weak too. Work force shortages are common and every staff is under pressure to meet targets of a number of programmes involving distribution of subsidies and inputs. Programmes are designed centrally (state or national level) and implemented with uniform guidelines. Districts and blocks do not have any flexibility to modify the norms. This is adversely affecting the performance of all activities.